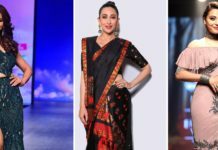 A Day full of Colours at Lakme Fashion Week - Day 4 - Wedding Affair var admin_url = "https://weddingaffair.co.in/wp-admin/"
Day 4 at the Lakme Fashion Week was a glaring and astonishing event flourished with expertise. The affair observed the presence of ace designers and prominent faces from the Bollywood industry. The collection leaped from elegant silhouettes to peppy beach wears that were bubbly, intoxicating and full of energy. The day heaved fresh breaths from refreshing talents. Armaan Randhawa, who made a second appearance at Lakmé Fashion Week Summer/Resort 2017 with his label EKAM unveiled his latest collection “Into the Wild” that aspires “The love of the Paradise”. 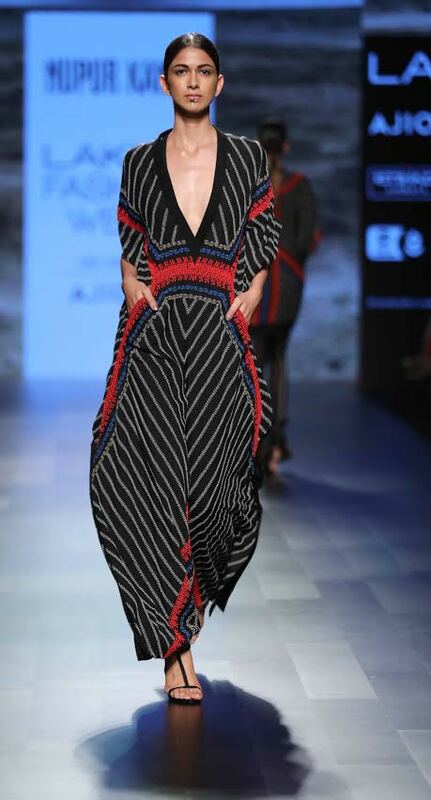 Armaan blended the traditional embroidery on the western silhouettes, giving a striking look in women’s wear. The colors inculcated in the collection were black, ivory, olive, beige, navy, grey, blue and red maroon and were eye catching. Sonal Verma’s Rara Avis label brought in display their “Abascus” collection which will fulfill the desires of the women who wish to mix and match wardrobe with statement making hand bags and accessories. Showstopper Urvashi Rautela donned the final look of the collection. Some of the highlights of the collection were slim dresses with bead work, the paper bag waist skirt, laser cut jacket and pink wrap maxi with ombré embroidered cover. 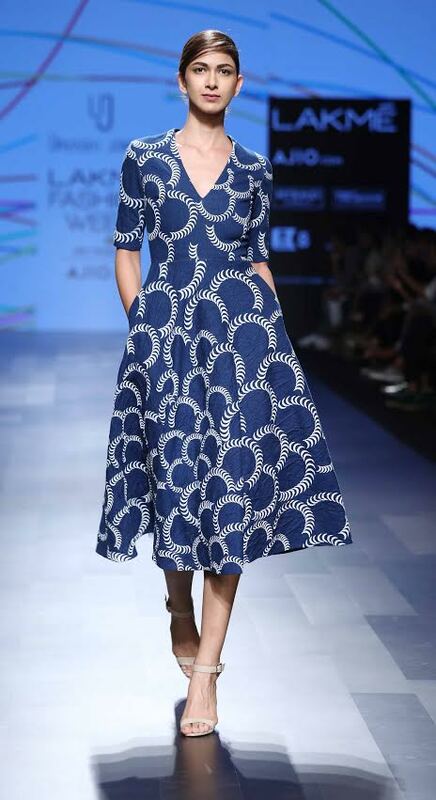 Urvashi Joneja unveiled her “Boundary” collection that unleashed an array of colors and created a style statement. The collection implanted high end casual and evening wear that featured geometric prints for one-shoulder summer maxis, pant suits, asymmetric tops and skirts as well as feminine floor length dresses. Shweta Kapur, who unveiled her collection “Collection No 8”, portrayed a fresh angle by way of textures and textiles that were inspired by the scaly skin. 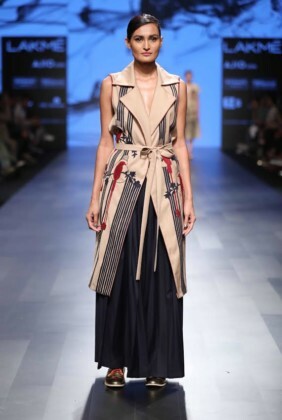 On the other hand, designer Swati Vijaivargie brought in her collection called ‘Love for Stripes’ that amalgamated Indian motifs with Mexican hues and patterns. 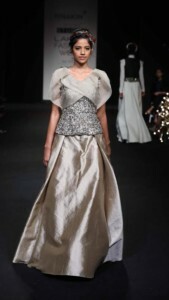 Bubbly and full of life, Pinakin launched his “Champagne” collection which flourished in style and fashion. The famed designer of interiors, furniture and fashion, unveiled shades of champagne hues like white, cream, beige and gold with hints of auspicious red for a glam line in his latest collection. Draped figure-contouring sari, seductive gowns, trendy jumpsuits, swirling fish tail skirts and cropped tops appeared on the ramp. Nishka Lulla brought in boho vibes at the Lakmé Fashion Week Summer/Resort 2017 as easy-to-wear styles floated down the runway. 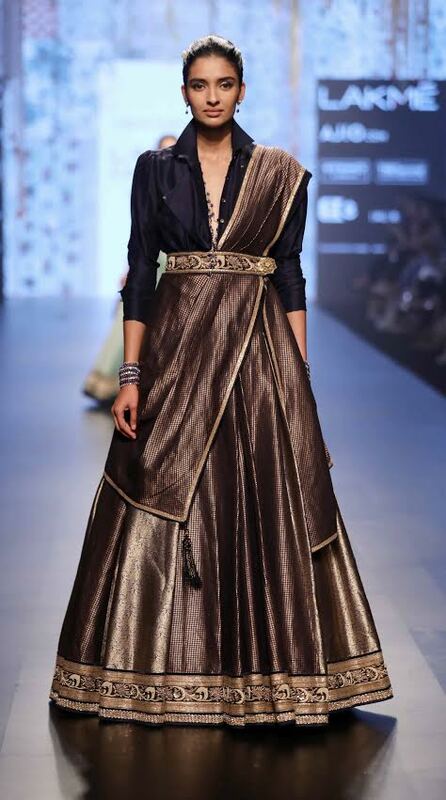 Nupur Kanoi on the contrary, put to display the earthy hues of Africa with ‘Lost and Found in Africa’ collection. Showstopper Bollywood diva Daisy Shah looked like a regal princess as she sashayed down the ramp in Amit GT’s magnificent draped textured gown with feather accents on the shoulders and discreet side pockets. Inspired from modern day royality like Princess Kate Middleton, Queen Rania, Sheikha Mozah and Queen Ameera, Amit GT unveiled his grand Red Carpet look at Lakmé Fashion Week Summer/Resort 2017. 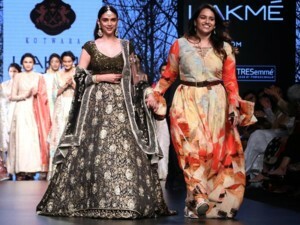 Aditi Rao Hydari turned the show stopper for ‘Romance Of Kotwara’ collection. She looked astonishing in black encrusted lehenga, a sizzling choli and an embellished tulle dupatta from the collection as she walked down the runway for ace Designer Kotwara. 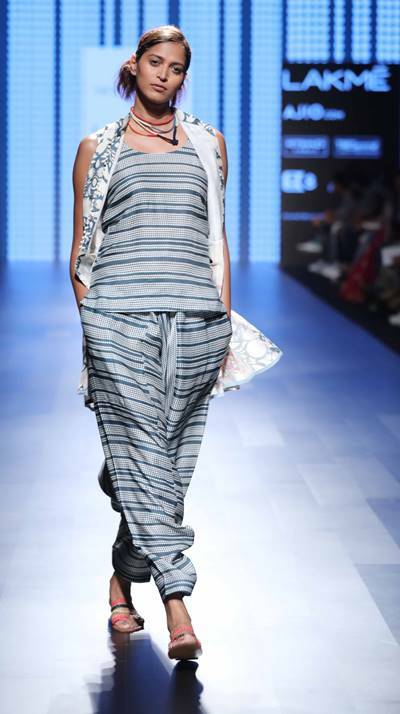 Day 4 closed with Tarun Tahiliani’s collection inspired from Mughal Gardens and architecture. The collection “Chashme Shahi” is a bridal wear collection, which is replete with timeless craft and textiles. Hollywood’s multi-talented Diva, Padma Lakshmi opened the show wearing an ethereal white heavily embellished lehenga, textured choli and sheer dupatta and ended the sensational collection in a peach/pink panelled brocade lehenga and pink silk shirt for the designer.